The Weather Handbook is the essential guide to how the weather is formed, providing readers with the ability to look at the sky and interpret its signs, and combine this knowledge with information provided by professional forecasts to assess for themselves what the coming weather is likely to be. This handbook has been the standard reference for almost 20 years for students on Day Skipper and Yachtmaster courses, and the handbook of choice for skippers and crew of cruising and racing yachts. It has now been completely redesigned for the third edition to be more user friendly, with new photos and updated explanatory text. 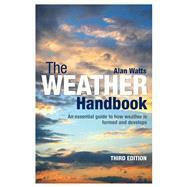 The book also addresses new sources of weather information that have exploded on to the market. There are countless websites and apps providing forecast data, and The Weather Handbook guides users in how to use and interpret this information for themselves. Alan Watts, one-time professional meteorologist, has spent considerable time studying wind changes and short-term alterations in the weather. This, combined with his enthusiasm for sailing which began with the sea scouts, led to his first book. He is also the author of the bestselling Instant Weather Forecasting and Instant Wind Forecasting both published by Adlard Coles Nautical.